It’s a big day for the Linux fans. Canonical has just released the latest generation of the Ubuntu operating system, nicknamed “Lucid Lynx”. There was a bit of a delay this morning, due to a bug in the GRUB bottloader, but if you head on over to the Ubuntu homepage you can see that it has just officially gone live. Ubuntu 10.04 LTS is the latest and greatest of the most popular linux distro. Canonical has some high hope for this release, they feel that Ubuntu 10.04 can be a commercial success, something that has sore of eluded them in the past. Ubuntu is the distro of choice, and has a huge loyal following, (including myself) but has never really become a huge commercial name brand. With the new release brings some big improvements, including a brand new theme called “Light” it’s a definate change from the previous “human” theme. It includes the desktop theme, splash screen and new boot logo. 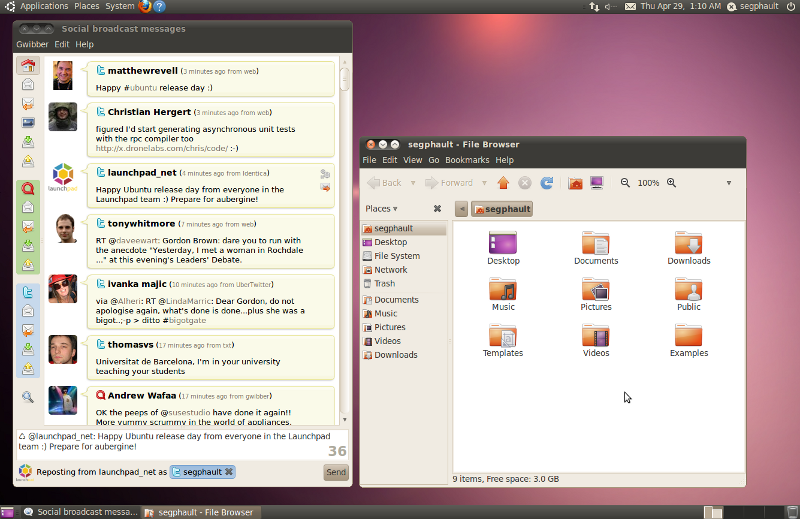 It brings a sort of a OSX feel to the Ubuntu desktop. There is also a new social networking addition, called the “MeMenu”. MeMenu provides an integrated access to all you social channels on Digg, Twitter, Facebook, Gtalk, AIM, Yahoo, and Windows Live Messenger. It will really appeal to the social network hungry user. The new version will include the Linux kernel 2.6.32 and improved support for Nvidia proprietary graphics drivers, while switching to the open source Nvidia graphics driver, nouveau, by default. Ubuntu 10.04 Lucid Lynx is now available in 3 major versions. The standard desktop edition, Ubuntu 10.04 Server Edition, and the sleek Ubuntu 10.04 Netbook Edition. All 3 are ready and waiting for you to download. If you have been on the fence about trying out Ubuntu or any Linux distro, now is the time. Ubuntu 10.04 LTS offers something for everyone. It is a great time for open source! I found an alternative website to obtain Ubuntu at very fast speed. I downloaded Lucid Lynx for 64bits in 9 minutes!! Previous Entry: Update: Steve Jobs Posts Open Letter Explaining His "thoughts on Flash"….